Head Manager of the Brewing Department at Carlsberg..
Mr C C Holmen. 1970. Mr K Georg Soresen had retired as technical director of Carlsberg Breweries. 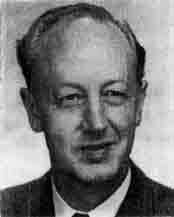 Mr Sorensen, who joined the brewery in 1934, became a director in 1960 and technical director four years later. His successor was Mr C C Holmen, pictured above.